NARS Cosmetics created the makeup look at the Marchesa SS2010 show. Inspiration: The inspiration behind the collection came from Madame Butterfly. “I wanted to capture the real look of Japan, create layers and bits of origami,” said designer Georgina Chapman. 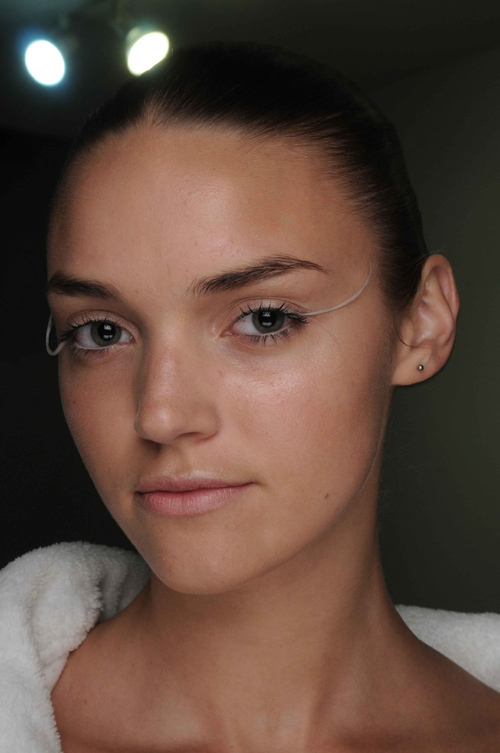 The whimsical creations based in sculpted layers balanced the soft, bare faces that were accentuated with long lashes. Look: Very simple, romantic and beautiful skin contoured with varying formulas. “We contoured the skin with matte and shimmery textures and added feathers to the eyes to provide dimension to the face,” explained lead artist Talia Shobrook. A matte face was illuminated with a bit of shimmer. Feather lashes, custom created by NARS from the feathers on the Marchesa dresses, gave excitement to an otherwise simple look.